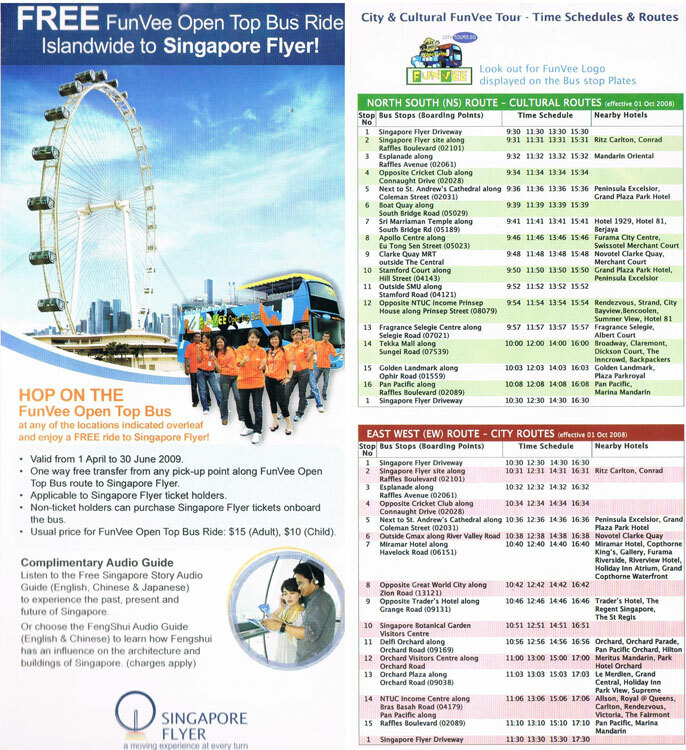 Please check www.singaporeflyer.com for daily schedules. located for visitors with special needs. Every capsule accommodates up to 5 wheelchairs with 15 other visitors. Speed of wheel rotation can be adjusted to ensure easy boarding for wheelchair—bound visitors. Towering 165 metres above the city, Singapore Flyer is a brand—new waterfront attraction like no other. Nestled in a hotbed of upcoming exciting developments in Marina Bay, it is a moving centrestage of experiences you will never forget. This unique observation wheel lets you enjoy unobstructed views from every direction. 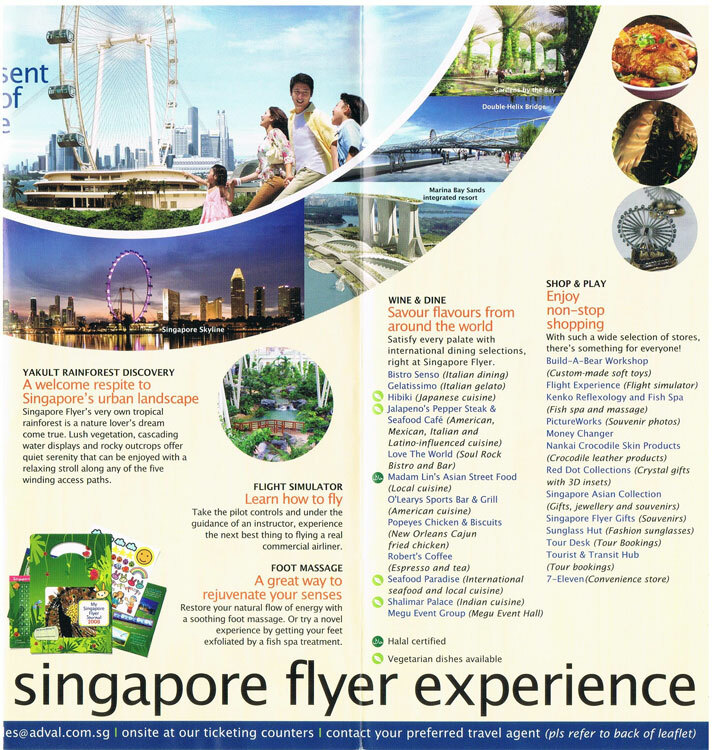 Come day or night, you will be able to take in the breathtaking sights of dynamic Singapore. Plus, wonderful glimpses of Malaysia and lndonesia. 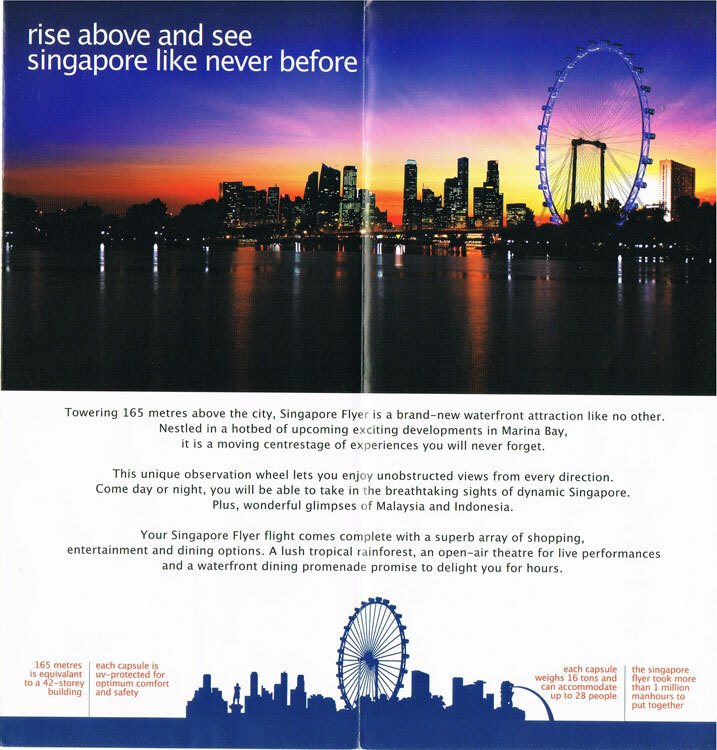 Your Singapore Flyer flight comes complete with a superb array of shopping, entertainment and dining options. A lush tropical rainforest, an open—air theatre for live performances and a waterfront dining promenade promise to delight you for hours. Singapore‘s favourite flight offers you the chance to take in full glory of the Lion City and beyond for 30 spectacular minutes. Top pick for private parties or intimate gatherings! A Top way to impress your clients or have a private celebration! privileges and Complimentary VIP Lounge Access**, this flight is the perfect way to indulge in an unforgettable experience. Please see below for Private Capsule Bookings. Come indulge with the Singapore Flyer and sample our specially concocted cocktail as you capture the breathtaking scenery of the Singapore Skyline during both day and night“. Your special perks include express boarding privileges, Complimentary VIP Lounge Access***, and a Signature Cocktail Glass Souvenir. Reserve an entire capsule for a truly exclusive flight that can accommodate up to 28 people. Ideal for both special personal occasions and even corporate events, this spectacular flight includes express boarding privileges. Optional Extras are also available. Call our Sales Team for pricing and more information. Contact our Sales Team for F1 packages. 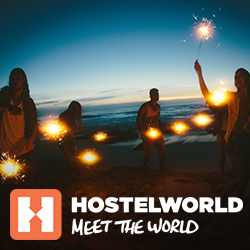 Surprise that special someone - be it a friend, colleague, family member or loved one — with an experience of a lifetime that will always be appreciated. 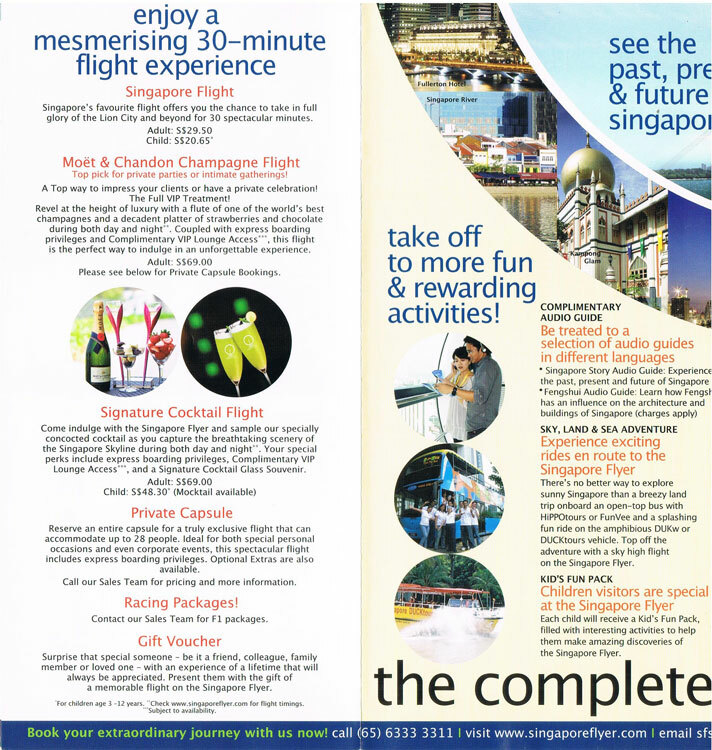 Present them with the gift of a memorable flight on the Singapore Flyer. HiPPOtours or FunVee and a splashing fun ride on the amphibious DUKw or DUCKtours vehicle. 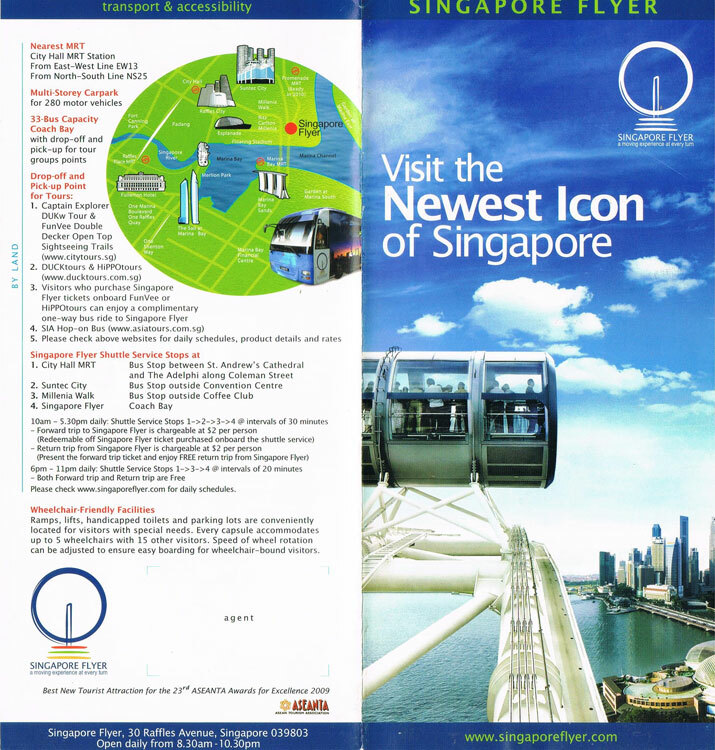 Top off the adventure with a sky high flight on the Singapore Flyer. Children visitors are special at the Singapore Flyer Each child will receive a Kid‘s Fun Pack, filled with interesting activities to help them make amazing discoveries of the Singapore Flyer. Singapore Flyer‘s very own tropical rainforest is a nature lover‘s dream come true. Lush vegetation, cascading water displays and rocky outcrops offer quiet serenity that can be enjoyed with a relaxing stroh along any of the five winding access paths. the next best thing to flying a real commercial airliner. A great way to rejuvenate your senses Restore your natural flow of energy with a soothing foot massage. Or try a novel experience by getting your feet exfoliated by a fish spa treatment. Savour flavours from around the world. Satisfy every palate with international dining selections, right at Singapore Flyer. Enjoy non-stop shopping With such a wide selection of stores, there‘s something for everyone!